Last weekend was Estonian open bird race in Saarenmaa Estonia. I put together a good team with Jarkko Santaharju, Roni Väisänen and Petteri Mäkelä. At Friday night we jumped to Tallink Silja ship and it left at 7:30pm towards Tallin. We landed to Tallin at 9:30pm and after rush and waiting in the ship we started our drive to Virtsu where is harbor and ferry to the Saarenmaa. Ferry started at Midnight and it takes 25min to get to the island. 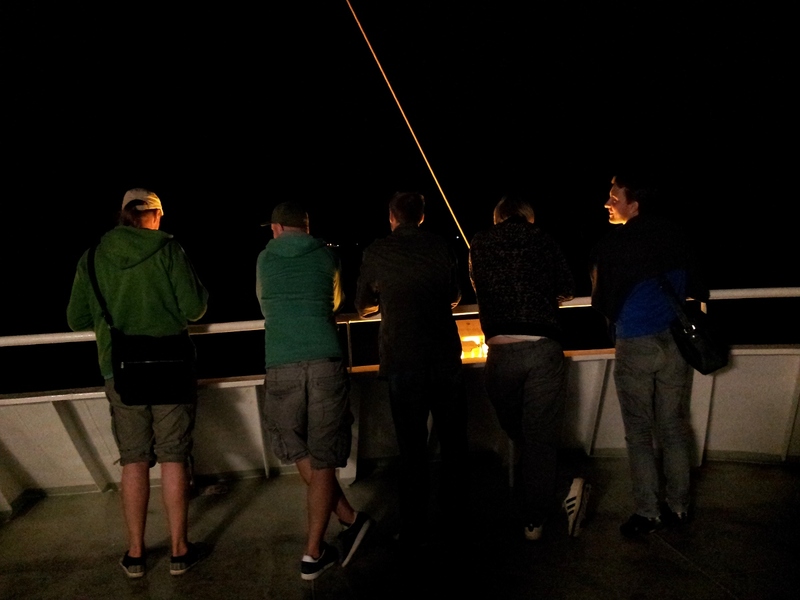 Also other Finnish team was in the ferry. From left, Petteri, Jarkko, Heikki, Roni and Markus. After ferry, we drove to place called haeska or valjala, can´t remember and we had nice 1hour 20minute time to sleep in the car before the race witch starts at 3am.. I couldn´t sleep even a minute... In the car was four guys and there was super hot and everybody was just sweating. Race time in Estonian Open is 03am to 5pm so 14 hours. We "woke up" at 2:40am and after boys had their smokes, we moved a little bit and when Race started at 3am we were outside and just listening. It was super dark and great fog came from somewhere... No birds in sound. Actually we even didn´t know where we were... Was it fields of forest? Nice start. At 3:15am we got our first specie, Tawny Owl. After that was Lapwing and more Tawny Owls. We heard atleast 4 different! After these and few Robin sounds, we planed to drive Southern side of he area. 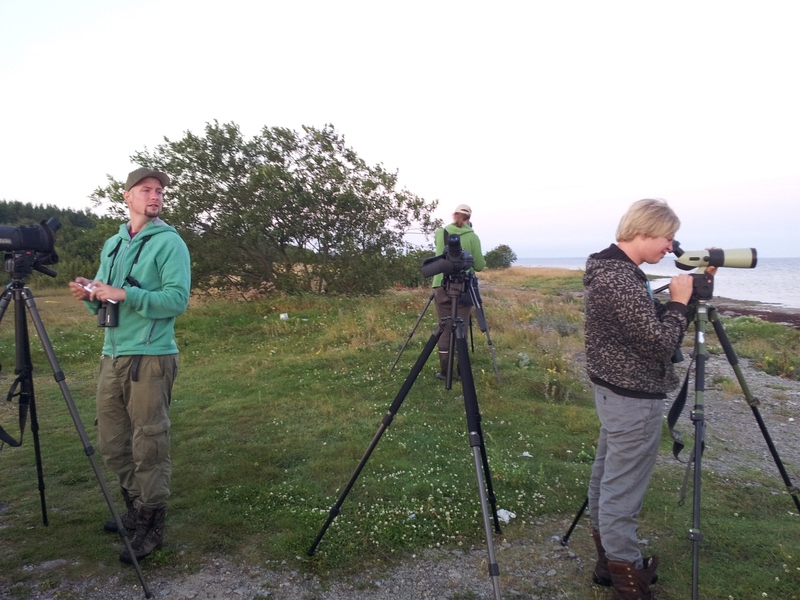 We stopped few times before we started our first sea watch and we got some good species like Wood Lark, Red-breasted Flycatcher, Redwing, Fieldfare, and Hawfinch. After poor night time we thought that game is over but it was not. Our sea watch started well and we got many good species from the sea, like Red-throughted Diver, Bar-tailed Godvit, Red-breasted Merganser, Rock Pipit and so on. Rock Pipit was actually ace for us, witch means that we were only team who saw that specie! Next few hour we drove around the southern side of are and we got species almost every stop, so we were in full swing! Jarkko, Petteri and Roni checking the sea. At mid-days, we decided to get coffee and little snack in Kuressaare witch is capital city of Saarenmaa. There was also big park but no good birds..
After Kuressaari we drove to the Orissaare witch is eastern side of the island. There was many waders and ducks and we got Black tern from there and Little Stints and so on. After nice watch, we drove to most northern part of the island but there was nothing... place was behind of the dogs and fences, so no chance... On our wa back, we found little open place and first bird what Roni saw flying on the sea was Arctic Skua! There was only 20minutes time left and we decided to stop on the open field are, watching some raptors and others. 4.50pm Petteri saw White Stork walking in the field and that was our last specie. Total count was 129! We were happy but there was few easy species what we missed... Magpie! Reed Bunting! Here was Sanderling, Red Knot and some others. We drove to the shop and then to hotel at Kuressaare where the evening event was. Sorry for messy copy from EstBirdings internet site. SO, we were at seventh place.. I think it´s good position when you watch these names above us. Old "racers" from Finland and some beginners luck guys also. An i must mention that we beat my uncles team first time. Thank you Roni, Jarkko and Petteri! This was grat fun and next year again of course. Thanks also Uku Paal, Margus Ots, Tuomas Seimola, Jukka Hatva, Lauri Mäenpää, Jände, Juha Sjöholm, Jari Laitasalo, Markus Lampinen, Juho Könönen, Heikki Erikson, Timo Böhme, Ari Vuorio, Petri Ripatti and Aki Arkiomaa. If your name is missing on this list, sorry and thanks. Tomorrow we start our trip to Ireland with Jände and Tuukka and Esko.